Hi there! I’m so happy you have found yourself at Amy Howard Social! My goal is to teach you how to be a Social Media BOSS by implementing helpful tips and tantalizing tidbits proven to double your online social presence and increase sales. First of all, what is a Social Media BOSS? 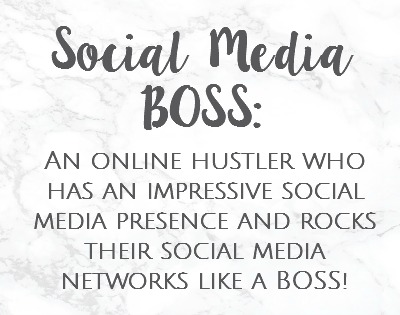 An online hustler who has an impressive social media presence and rocks their social media networks like a BOSS! I launched Amy Howard Social in August of 2015 and have spent countless hours to learn all that I can concerning social media. Through many webinars, classes, research, and trial and error I have got this social media thing figured out. Save yourself the many hours of research and stick with me. I will teach you the ins and outs of social media and help you rock your social media like a what??? Yes, that's right a BOSS baby! My heart and passion is to help other women like myself run a successful business and/or blog by teaching them exactly how to have a successful social media presence! I work specifically with power women entrepreneurs who require an online presence that matches their offline hustle. Teaching you how to manage your social media networks and making you look as fabulous as you are is my specialty. Do you want to be a Social Media BOSS? I’m a manner minding, sweet tea drinking, Southern lady y'all. Yes, I am a 30 something year old and I am still a daddy's girl. I will take dogs to humans any day. I’m kinda sorta obsessed with paper goods; notebooks, agendas, shiny office accessories are my weakness. Give me anything Kate Spade and I can rule the world! I admit it. I am a Pinterestaholic. I am taller than the average southern belle standing at 5'10"
I am a wife of 8 years and married to my best friend. We have a happy marriage full of love, support and understanding (sometimes). My cup runneth over. I was at a point in my life where I had to either "go back to work" or make a living at home - with the Superhero. I opted for the second choice and I have just under one year under my belt. It has been a roller coaster to say the least, but the good Lord has blessed me with the right ladies in my life and clients along the way. Too good to be true? Nah, that's called grace my friend.